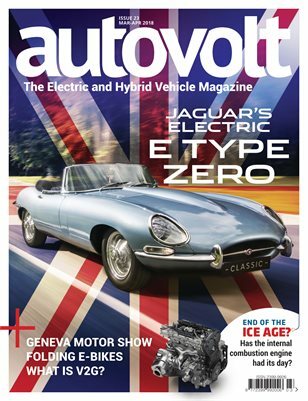 Main features are: • Feature: Jaguar E-Type Zero. • Interview: Tim Hannig, Director, Jaguar Classic. • Feature: End of the ICE age? • Feature: What is V2G? • Geneva Motor Show Highlights • Reviews: Hyundai Ioniq PHEV, Kia Niro PHEV, Kia Optima PHEV • Long Term Test: Toyota C-HR Hybrid. • History: BMW 1602 Electric. • Glovebox: Folding e-bikes.